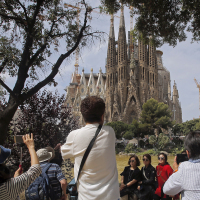 The Brexit vote "hasn't affected" tourism to the Spanish region of Catalonia, according to its tourist board chief - and security fears affecting other places may have helped boost visitors to the area. The number of UK visitors to the region rose to 1.8 million in 2015, a 4.2% increase on the previous year. The figure is likely to increase for 2016, with 1.7 million Brits have already paid a visit to the area in the first nine months of this year - a 6% rise year on year - which is likely to leave the destination close to its target of two million British visitors by the end of next month. The number of British tourists has increased every year since 2011. Speaking at an annual gala dinner in central London, attracting more than 100 members of the UK travel trade, Vicenc Capdevila, UK & Ireland director for the Catalan Tourist Board, said: "Brexit hasn't affected us at all this year, in the first nine months of the year we have had more than 1.7 million [British visitors], which is 6% up year on year. I think we are going to be very close to two million, and 2017 is going to be even better. He says the reason for the region's popularity could be due to new Jet2 and Ryanair services to Girona which started over the summer. He adds that security fears in other destinations could mean tourists are choosing to visit Catalonia over other destinations. Mr Capdevila said: "When you look at some of our competitors for sun and beach, like Turkey and Tunisia, they're going through difficult times. So many British tour operators have diverted their flights to 'safer' destinations like Spain, especially for families who want to go somewhere familiar." Capdevila also attributed the region's heightened profile to its selection as a European Region of Gastronomy for 2016, flying over the two-Michelin-starred chef Jordi Cruz - the youngest chef in Spain and the second-youngest in the world to receive a Michelin star - for the gala dinner. Capdevila added: "A lot of people are interested in food, and even if very few travel just to try new restaurants, when you are comparing two destinations, then gastronomy adds extra value. Eating out is quite affordable in Catalonia, and this title has definitely helped us with branding."